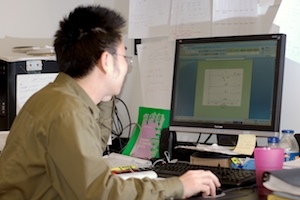 Chemometrics is a new discipline that involves the applications of mathematics, statistics, and computer science in solving chemistry problems. With the insights into how the physico-chemical information was produced by the instrument, we wish to extract the essential information from the raw signals in presence of substantial interference, and then correlate them to the physico-chemical properties. This can provide fundamental understanding of chemical systems investigated. Employing domain knowledge for effective mining and information integration of chemical systems. Our usual practice is to apply our methodologies to facilitate applications of Raman spectroscopy in several fields, e.g. cancer diagnosis, embryo implantation, pulp and paper properties measurement, etc.